Handpainted Wood Dollhouse Furniture - The Daisylane Master Bedroom includes a double bed with rosebud motif & bedding, vanity table stool & mirror, wardrobe with hangers, nightstand, and hat box. This wood dollhouse bedroom furniture is handpainted in delightful pastel colors and offers the perfect sleeping space for her favorite dolls. 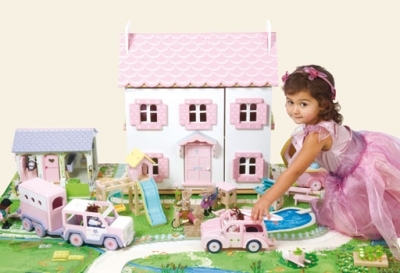 Watch her imagination grow as she designs their home, piece by piece, room by room. Includes: All sold in pretty pink packaging.